Dril-Quip is leading the industry in verification and validation testing of Specialty Casing Connectors with a methodology that incorporates 2D and 3D finite element analysis along with physical testing to validate the design, structural and operational performance of our connectors. The company has over 60 connectors fully verified and 16 connectors validation tested to ISO 13679: API 5C5 standards, with more testing continuously in process. 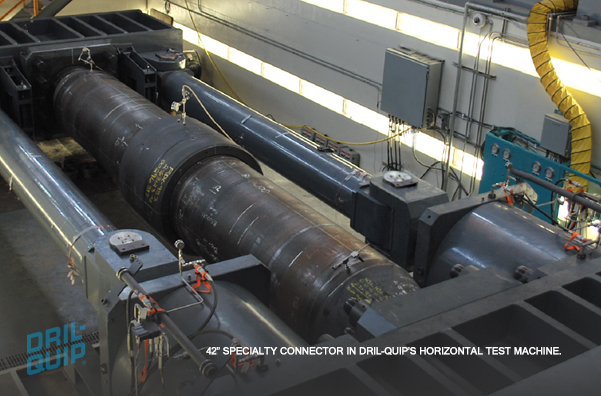 Dril-Quip’s state-of-the-art 20MM ft-lb Horizontal Test Machine can qualify connectors for the end user to validate compatibility with any pipe strength/well condition and prove suitability for multiple applications.